Many Americans hope to see practical “changes” during President Obama’s second administration. Chuck Hagel, Obama’s choice of Secretary of Defense, has been accused of having “isolationist ideas”. Does Chuck really have isolationist ideas? Is it possible that we’re being misinformed or misled? The following article was published in today’s Jerusalem Post. The highlights are mine. Iranian foreign ministry hopes new defense secretary will lead to “changes;” Knesset speaker says Israel concerned, but not afraid. “We hope there will be practical changes in American foreign policy and that Washington becomes respectful of the rights of nations,” Foreign Ministry spokesman Ramin Mehmanparast said at his weekly news conference, Iran’s IRIB news website reported. He was answering a question about Hagel’s views on Israel and US sanctions on Iran. Hagel is expected to face a tough confirmation fight amid accusations that he has anti-Israel views and has previously urged direct nuclear talks between the United States and Iran. Rivlin stated Hagel’s approach should be “of concern to Israel, but not scare her,” adding that Israel must know how to handle the move without isolating herself from the stronghold of American security. To further quell recent concern over Hagel’s appointment, Rivlin added “one person does not a policy make,” stating that the individual appointment will in no way endanger the strategic relationship between Israel and the US. On a similar note, Deputy Foreign Minister Danny Ayalon gave a positive view of Chuck Hagel’s nomination as US defense secretary, though some commentators in the Jewish state expressed worries that the choice could open a new fissure in bedrock ties with Washington. US President Barack Obama named the former Republican senator for the Pentagon post on Monday, setting the stage for a confirmation battle with critics who question his commitment to Israel in its struggle with Iran and other regional adversaries. Meanwhile, a right-wing pro-Israel group has taken Hagel’s name on a website, stepping up the campaign against his nomination. The site, which went live last week with www.chuckhagel.com… is funded by The Emergency Committee for Israel, a non-profit organization running campaigns on the positions of political candidates in America. The website raises questions regarding Hagel’s ability to serve as defense secretary, highlighting statements seen as anti-Israel or anti-Semitic. The daily Israel Hayom on Tuesday quoted an unnamed government official as saying the choice of Hagel was “very bad news,” adding: “Clearly it won’t be easy with him.” The official, reflecting the belief of several Israeli analysts that Obama would continue to set the tone for bilateral relations, suggested that having Hagel in the Pentagon would allow the second-term president “to play ‘good cop'” with Netanyahu. 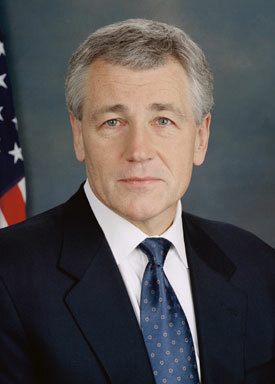 Many Republicans contend that Hagel, who left the Senate in 2008, at times opposed Israel’s interests. He voted several times against US sanctions on Iran, in whose nuclear program Israel sees a mortal threat, and made disparaging remarks about the influence of what he called a “Jewish lobby” in Washington. Tags: Chuck Hagel, Danny Ayalon, israel and palestine, israel and palestine conflict. Filed under Israel and Palestine, israel and palestine articles, israel and palestine conflict by Father Dave on Jan 9th, 2013. Comment.